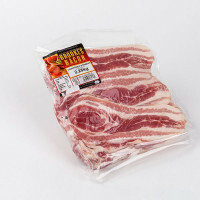 Brookes Streaky rindless bacon 2.27kg/5Ib pack. Brookes bacon comes from reputable farms in the UK and accredited European farms. Ideal for pigs in blankets and covering roasting joints.